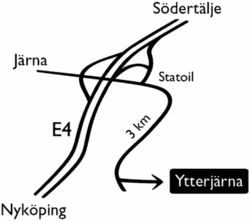 From the E4, take Exit 141 toward Järna. Once off the highway, turn left (away from Järna). Follow road 57/219 towards Nyköping. You will see the large Culture House – drive 500 meters, you can find parking on the right. We recommend you plan your trip using www.resrobot.se, a travel planner website that shows your travel options from any location in Sweden to any other location in Sweden by Public Transport. As a destination you should use “Kulturcentrum Järna (Södertälje)“. Follow the signs inside the terminal to find the bus stop. Catch the Airport Coach (bus) in direction Stockholm C. Tickets can be bought online, from the driver*, or from one of the information desks inside the terminal. Leave the bus at Stockholm C.
Follow the directions from Stockholm to YIP. This route is faster, but more expensive. Follow the signs inside the terminal to find the escalators to the underground Arlanda Express train station. Catch the train. All trains go to Stockholm C non-stop. Tickets must be bought from the ticket machines before you enter the train. Tickets bought on the train have an extra fee. Exit the arrival terminal, and take to the right. Walk to the departure terminal. Catch the Flygbussarna Airport Coach (bus) in direction Stockholm C. Tickets can be bought online, from the driver*, or from one of the ticket machines. Search for public transport connections from Skavsta Airport to YIP at www.resrobot.se. Board the Commuter train from Stockholm C in direction Södertälje C (usually track 15 or 16). Tickets can be bought at the stairs to the platform. Leave the train at Södertälje Hamn. Board the commuter train in direction Gnesta. If there is a direct connection, it is waiting at the other side of the platform. Leave the train at Järna. Your ticket for the train is valid for the bus if it is less than an hour since you bought it. If the bus in point #6 leaves later than this, you must buy a ticket for the bus at the Ticket Office inside the station (you pass through it on your way out). It is not possible to buy tickets on the bus. Go down the stairs from the platform, and take to the left. Wait for bus #784 at the bus stop outside of the station. Leave the bus at Stensta (you may ask the bus driver to alert you). You should see the Culture House clearly from the bus stop. It is a couple of hundred meters to walk there. PS! A few buses also go to Vidarkliniken, next door to the Culture House. Board the Commuter train from Stockholm C in direction Södertälje C. Tickets can be bought at the stairs to the platform. Leave the train at Södertälje C.
Follow the flow to the end of the platform, and take right. Your ticket for the train is valid for the bus if it is less than an hour since you bought it. If the bus in point #5 leaves later than this, you must buy a ticket for the bus at the Ticket Office in the station building (see map). It is not possible to buy tickets on the bus. Find the sign for bus #702 in direction Tullgarn. Wait for the bus. If you have feedback or corrections regarding the directions on this page, please contact us.